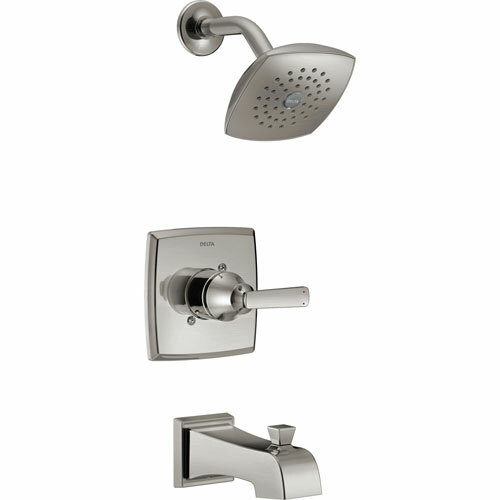 The long and short of it: This Tub and Shower Control is a fully functioning Tub & Shower Combination Faucet which comes with a Showerhead and Tub Spout. It has a Single Handle to control the Tub/Shower (on/off and to adjust temperature). It also includes the required Rough-in Valve which installs in the wall. The water is pressure-balanced and mixed in the Valve and then sent to either the Shower Head or Tub Spout. Simple, Stylish, and Functional. Buy this Delta Ashlyn Modern Stainless Steel Finish 14 Series Watersense Single Handle Tub and Shower Combination Faucet INCLUDES Rough-in Valve D1170V Now!